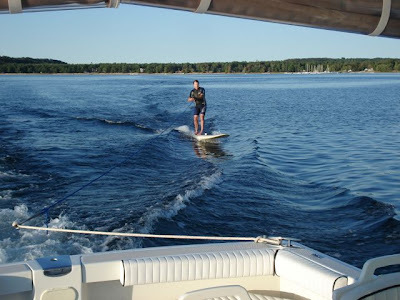 Several years ago while moored off the coast of Catalina Island, Daniel and Elizabeth buzzed by us and asked if I wanted to go wakeboarding. " SURE! " I yelled as they passed our stern in their dinghy. Daniel is a surfer and always had his surfboard on their boat, it was about a 6' 0" so we used his board. It was challenging to get up from lying down on the board to standing up while being pulled and timing it just right to coincide with accelerating to a plane. It took talent and energy to get up but it was well worth the effort. The surfboard carved easily but didn't allow for any mistakes and we both ended up having some good wipe-outs. 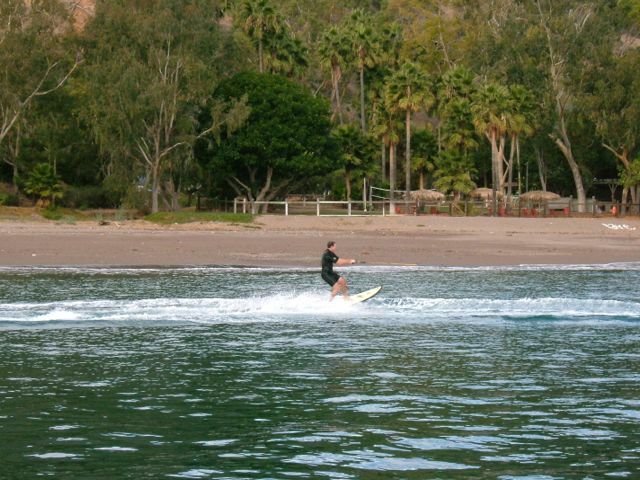 Wakeboarding on a short board, Catalina Island. Fast forward to last summer. It's the end of another perfect day in Northern Michigan. The wind died hours ago and the sun is positioning itself for a spectacular set. I am restless to get some sports in, to squeeze just one last ounce out of the day. I grab some line, peal on a wetsuit and I paddle out —this time on my 12' Original Windsurfer— and wait for Brad to meet me beyond the harbor. Brad maneuvers the boat slowly past me and tosses the line. Once the slack in the line is gone, I casually stand up. 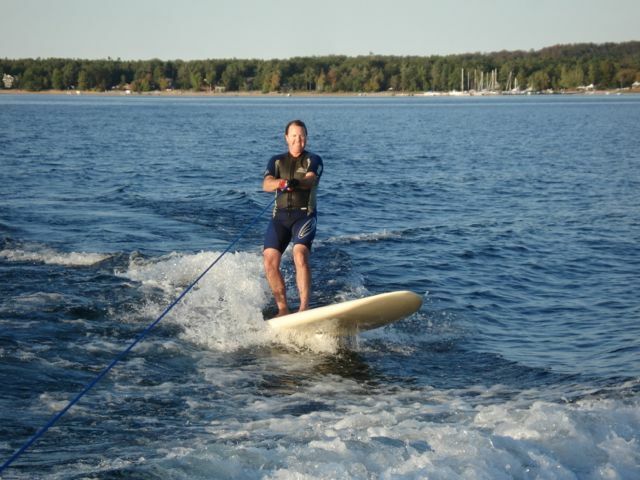 I give Brad the "Thumbs up" and as he throttles-up a wake forms behind the boat. I slip into the wake and begin walking around the Windsurfer board like I am the only person on a dance floor and I have it all to myself. The board is stable, and I realize quickly that we could be dance partners. I am not a cowboy breaking-in a wild horse. No, we are working together. I step towards the tail, moving my weight towards the inside rail to carve a turn, then several steps forward to keep the board in the wake, then a few steps back to enjoy the ride. 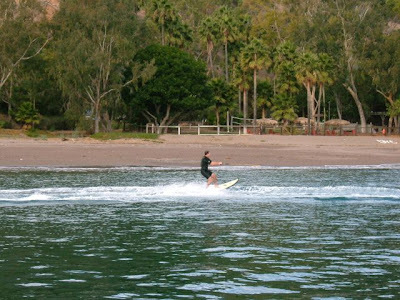 Brad accelerated more and the wake gets larger and the board glides into a sweet spot. We are one and I am not getting bucked off for some time. Constantly making adjustments —and playing with the wave— on a long ride. Wakeboarding the Windsurfer reminded me of longboarding a point break. Relaxed, time to really enjoy the ride and loads of places to move your weight around to work with the board to play in the wave. Constantly making adjustments —and playing with the wave— on a long ride. I've described the Original Windsurfer as a surfboard and I guess this is just one more way that it is. I was stoked to squeeze that last ounce out of the day!